These books feel so sci.fi. Like people went to a planet, forgot and started anew. It is fantasy with big guns. Now when I have read two books I have started to wonder, do they put all their energy and time into military tech (since they have no phones or well tv ;) They are constantly under attack and have been so for hundreds of years. Of course all they do then is military tech. See, I so want to ask the author these things. Plus there is magic so why bother making things with tech when you can use magic. Such a fascinating world. I at once had to check if there is a blurb for book 3, nope, but a cool cover. See all these books takes place on different continents, but what they have in common are freaky things trying to kill and eat them. I ave not even started with the story! Right, princess Nix, her family are aholes and should die die die! She is given away to a foreign lord and this is the best thing that could happen, cos like I said, her father and brother needs to burn burn BURN! Poor Nix, she bore her scars well. Donal, the highlander was awesome too. He was witty, and flirty, without coming on too strong, or making her uncomfortable. This is military fantasy so there is a lot of fighting and trying to find the baddies. A really great and fun series! I can not wait for more. I do enjoy these. I also really liked the end of this one, it was so fitting. Her voice for Earth is so fitting. I also like her other voices and as I am well aware of she does a great highlander brogue. She brings everything to a narration and it makes for a great listen. What a perfect opening to your review and yes I think that's a good sign of a good book wanting to pick the author's brain. Glad you liked it! And the narrator is new to me I want one of her books too! I hope that you will like this one too! That does sound like an interesting world. I don't always love her stuff, but this one sounds like something I would really enjoy. Will have to pick up the first! Good to hear you are enjoying this series and well a highlander thrown in with this one, what could be nicer! Hmmm... I really liked the first book so much and I'm bummed we start all over with new characters in book two... I'll have to listen at some point, but not yet. Glad you enjoyed. I never got to finish the series I started by her, but I do want to read her again. And nice, it's Justine Eyre! 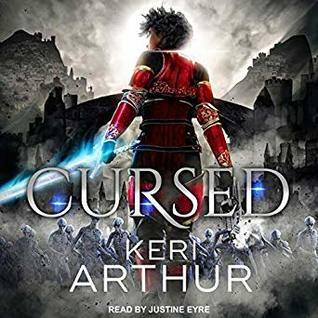 I do like Keri Arthur. I am going to have to add this series to my list. I didn't enjoy this one as much as the first, but still a good story.